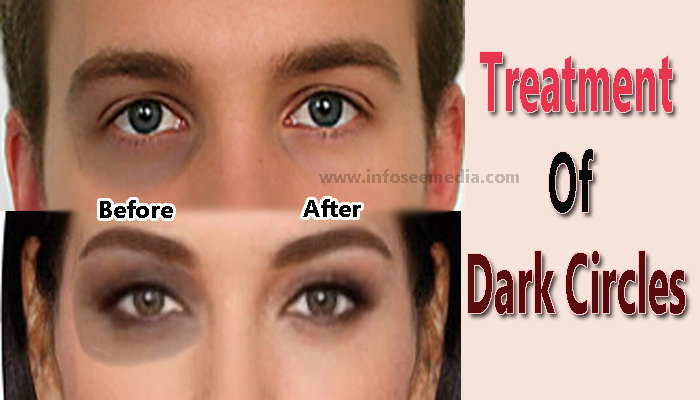 Hello friends, today we will talk about the treatment of black circles around the eyes or those we call dark circles. In dark circles, the color of the skin around the eyes becomes much darker than the skin color and our face looks very bad for this reason. It is not a disease, but it is a symptom that there is some disturbance in our body somewhere. The skin around our eyes is thinner than our face’s skin. There is also less oil and sweat glands in it. Therefore the skin around the eye remains dry and it also damaged too quickly. There are many reasons for dark circles surrounding the eyes. Therefore, when we start treatment, we have to pay attention to the lack of internal components as well for which the dark circles are becoming. Burning of skin around the eyes due to sunlight, It happens to most people. When we get out in the sun, we do not think that we have to protect our skin from burning from sunlight. Often people are allergic to face creams, lotions and make-up. Especially those creams and lotions and make-up that have a lot of fragrance and color. This causes itching in the skin and repeated scratching causes dark circles. Daily our skin came in contact with dirt, dust petrol and oil smokes present in air which causes dark circles. If you did not drink enough water, the skin around the eyes starts drying and becomes black. Dark circles also become due to lack of nutrients in the body like vitamin A, B12, C, D, E and lack of blood. Fatigue, stress, lack of quality sleep, drinking alcohol and smoking cigarettes also causes dark circles around the eyes. The entire treatment of black circles can be done only when we treat the upper treatment as well as treating those things which create dark circles. There will definitely be some advantage over the upper treatment, but as soon as you stop the treatment, your problem will emerge. Therefore, both upper and inner treatments should start with. Firstly save your skin from the sun’s rays. Before you exit the daytime, place SPF20 sunscreen around your eyes. Wear black glasses when you go out of the house in daytime. It not only protects your eyes from burning from the sun’s rays, but it also protects your eyes from the dust, mud, dirt which present in the air. From now on, minimize the use of fragrance and color cream lotions and makeup around your face and eyes. Drink more water so your skin does not dry up. Consuming good food is not only beneficial for our skin but also for the whole body. If you do not give nutritious food to your body, then your problem can never be solved, even if you put expensive and expensive cream or medicines on your skin. Nutritious diet gives our body the strength to fight all kinds of diseases and makes our skin healthy and shiny. Vitamin A, D and E are found in good quantities in tomato, apple, carrot, spinach, pomegranate, banana, mango, peeled lentils, rosemary, eggs, milk, butter etc. If you eat them, then your body will get good amounts of vitamin A, D, E etc. To cure the shortcomings of these vitamins, you can take a cod-liver-oil capsule called “Seven seas” from chemist shop. You can take a tablet after eating it every night for 2 months. But do not take it for a long time. Vegetarian people probably would not like to take it because it is made from oil extracted from the fish’s liver. You can get vitamin C in plenty of fruitssuch as lemon, orange, tamarind, banana, pineapple, plum, guava. Vitamin B12 deficiency often leads to dark circles, especially to vegetarian people. Because Vitamin B12 is only found in meat, fish, chicken, eggs, milk, curd, butter. If you are vegetarian and do not consume too much of milk curd, then you should eat B12 tablet twice a week. This protects your skin from being a dark circles. The lack of blood in the body can be accomplished by eating green vegetables such as spinach, fenugreek, soya, banana, apple, tomatoes and by eating non-veg eggs and meat etc. Mixture of of tamarind, honey and amla(gooseberry) also cures the lack of blood. A bit of comfort and good quality sleep at night helps a lot in reducing dark circles. As I have told you earlier, the skin around the eyes is dry, it must always be moisturized. For this, I recommend that you put coconut oil well around the eyes in the morning after bathing and before sleeping at night. Coconut oil protects our skin against bacterial infections, fungal infections, sunlight and allergic reactions. And keeps our skin soft. You can apply hopney three times a week on your dark circles before sleeping. This helps in reducing dark cells. Wake up in the morning and wash your face with lukewarm water and then moisturize the dark circle area with coconut oil well. In the same way you can put the fresh aloevera gel around the eyes. After putting it, leave 30 minutes and then wash it with cold water and put coconut oil. You can also do this three times a week. Cut a very thin piece of cucumber, stick it over the eyes, remove it after 20 minutes and wash the face well with cold water, then apply coconut oil. You can also do three things in a week. Honey and the juice of raw vegetables cleans the skin well, But daily use of them can be allergic to the skin. And the juice of raw vegetables dries the skin. Therefore it is very important to moisturize the skin by applying coconut it after applying them. Friends share this post with your friends and family who have dark circles under their eyes. If you want to ask any questions then please insert it in the comment box.